Meet Eli Abramoff-Colman R.Kin., CEP. Because our primary focus is on reducing and preventing Central Nerve Interference an important aspect of your care is the Insight Scan System. To truly help you heal we employ a state-of-the-art scanning system that enables us to best understand the underlying issues at the root of your health concerns. The Insight Millennium Subluxation Station provides various scans to better understand your nervous system and muscle activity. This scan helps to detect areas of deep nerve disturbance that no x-ray or MRI can detect. We are then able to track the effectiveness of treatment and monitor your results to ensure we are providing the best care. SEMG will measure the amount of electrical current in the muscles. 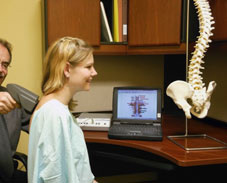 Thermography will measure the skin temperature along the spine. Want to see how you’re scan will look? Give us a call and we’ll setup a time to show you!